We really liked the original MSI G4Ti4600-VTD but probably its biggest downside was a rather plain looking appearance (if you can call that a flaw). Style plays a key role in today's computer hardware market and the older plain green G4Ti4600-VTD is the technical equivalent of bell bottoms. To be honest it was a bit surprising to see that MSI's first GeForce4 Ti4600 was using the green PCB - after all their previous flagship videocard the G3Ti500-VTG was a rather spiffy red, and so are most of MSI's motherboards. The new Champion Edition G4Ti4600-TD is not red but purple in colour! 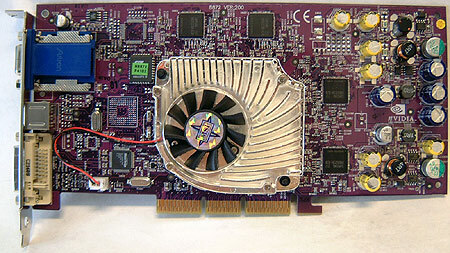 Using the same shiny GPU cooler, the videocard does look very fancy. In terms of actual hardware features though, the new Champion Edition has been downgraded just slightly. As you'll probably notice, the original was called G4Ti4600-VTD while this Champ Ed is only the G4Ti4600-TD. The main difference is the older VTD has VIVO (Video In/Video Out) while the Champ Ed only has TV-Output. The new Champion Edition still has most of the other goodies that the original G4Ti4600-VTD does, that being DVI-Analog converter, S-Video cable and you still get an excellent software bundle! You get the driver CD (obviously), MSI DVD, AquaNox, Sacrifice, No One Lives Forever and a seven game demo CD's! WinProducer and WinCoder which were included in the original package are not included here because the Champion Edition doesn't have those video in capabilities. Since the GeForce GPU supports dual displays we would have liked to see two DVI ports (much like the Gainward GeForce4 Ti4600 ) rather than the one DVI and one analog. Dual DVI's are the only way to ensure one can actually use two of any type of monitor. For a bit more information on GeForce4 technology, please read our GeForce4 preview or Gainward GeForce4 Ti4600 review. While the GPU cooler on the MSI Champ Ed. Ti4600 looks pretty awesome it was also pretty loud for a GPU heatsink/fan, but by no means though is it near the 50 db that TomsHardware is claiming! If it was in fact that loud, it would be noisier then the 60mm 36 CFM Delta fans! The stock videocard fan is comparable to the Thermaltake's Crystal Orb in noise level from my own experience. From personal use of the original MSI G4Ti4600-VTD that I plunked down $600CDN on so long ago I can tell you that in an enclosed case the GPU fan really isn't audible. I'm using the stock Intel heatsink for my home system (Pentium4) for those who are wondering. It seems that manufacturers are taking more care in their products these days and the almost all the videocards we've seen in the last year or so use thermal paste between the heatsink and GPU rather than the cheap, lousy, horrible, Thermal Interface Materials! Of course the Champ Ed Ti4600 is no different. MSI put a good amount of thermal paste between the GPU and heatsink, not too much - but just right. The MSI Champ Ed. Ti4600, like all other Ti4600's out there, is equipped with 128MB of 2.8ns BGA Samsung DDR RAM. The default clock of the memory is 660 MHz which makes it 10 MHz higher then the rest of the TI4600's out there. Of course since the DRAM has a rating 2.8ns, it means that in theory the memory should be able to run at at least 714 MHz (1000 MHz / 2.8ns x 2 = 714 MHz).